You can peel the potatoes first or do it after they've boiled. This is a make ahead recipe so you will cut the potatoes in half and place into the pot you'll be boiling them in and fill it with cold water. Place into the refrigerator to soak overnight. This will remove excess starch from the potatoes. The next day when you're ready to boil, just place on the stove and put on the high heat. Boil till done. In the meantime peel about 15 to 25 garlic cloves and set aside. Using an oven proof frying pan, pour some olive oil into it and heat, toss in your garlic cloves and cook till garlic is browned and carmeled then place whole pan into 350 degree oven for about 15 or so minutes. While the garlic is in the oven, mash your potatoes. When garlic is done put into food processor and whip into a paste. Transfer the garlic paste into pan again and add some heavy cream, salt, pepper, and at least one stick of butter or margarine. Add the potatoes and mix well. Adjust ingredients for taste and texture. 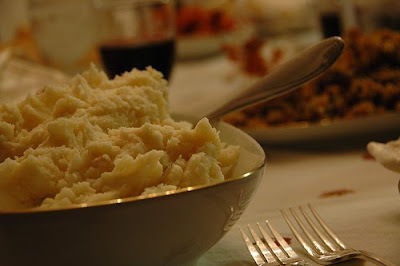 Garlic mashed potatoes are one of my absolute favorites! I'll have to try yours with the roasted garlic. My mouth's watering already!